Google demonstrated a bunch of new apps at its Google IO developer event in Mountain View including a new Assistant to take on Siri and Cortana. Keen to move beyond Google Now, Google also demonstratedAllo, a smart messaging app andDuo, a video calling app 'for everyone'. Allo and Duo will be available this summer on Android and iOS. So here's how Google is going beyond Google Now. During the product demo, we were shown Google Assistant looking up movie listings as well as processing phrases like "is that any good?" to find reviews or a trailer – the point being that it uses conversational cues. Google wants to put Assistant in its wearables, Android in-car as well as in phones. Expect it in Google Chrome, too. "This has historically been hard for computers to do," said Google CEO Sundar Pichai. "The reason we can do it is that for the last decade, we've been building the world's best natural linkage processing technology." You can chat one-on-one with the assistant, or call on Google in a group chat with friends – so you can ask if your flight is delayed using natural language. Allo is a smart messaging app based on your phone number. It's designed to make your conversations easier. There's a Smart Reply feature similar to Google Inbox so you can respond to messages without typing a word. And, of course, it learns the more you reply to. And you can use emojis and stickers, too. The app has deeply integrated machine learning according to Google. Google Assistant lets you bring things like Search, Maps, YouTube and Translate to all your conversations in in Allo. If it's a group chat, your mates will see the results, too. The idea is that you no longer have to bounce around apps to look things up. There's also an Incognito mode in Allo. Chats in Incognito mode will have end-to-end encryption like WhatsApp and discreet notifications. Duo is one-to-one video calling for Android or iOS and can work on a variety of fast and slow internet connections – although the quality only goes up to 720p HD. Again it's based on your phone number, allowing you to reach anyone in your phonebook. The apps seamlessly transitions calls between cellular and Wi-Fi. Knock Knock, shows you a live video preview of the caller before you answer the call. So you can see what kind of mood they're in when they're calling! Once you answer, Duo seamlessly transitions you right into the call. All calls on Duo are end-to-end encrypted. How does it differ from Hangouts? 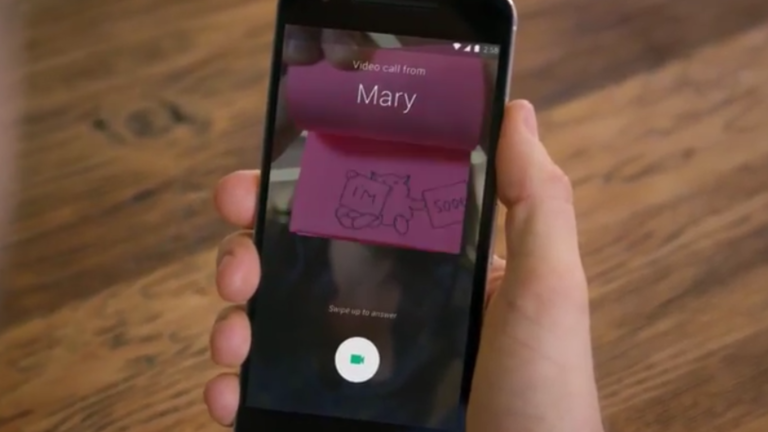 Google's Hangouts app does video calling already. However, Hangouts may become more business-focused for Google Apps users and is for groups while Duo is one-to-one only. Again, both Duo and Allo are like WhatsApp in that they work based on your phone number rather than your login (although we bet it asks for that, too). Now why not check out all the new Android N features?